Sensibo makes your existing air conditioner smart and connected! Sensibo is an external device that you pair your remote controlled air conditioner with. Sensibo will work with the majority of infra-red based HVAC systems whether it is a mini split, window AC, ductless, portable, heat pump and even central air conditioners. 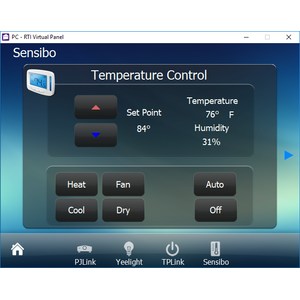 The Chowmain driver for Sensibo communicates to Sensibo via the Sensibo Cloud API which enables full two way control and feedback over room temperature, humidity, setpoints, hvac mode, fan speeds and swing. The Sensibo is Wifi based/USB powered you can easily retrofit them into existing jobs. Keep stock them in the back of your van and upsell them on customer visits. The product can be purchased off the shelf from retailers such as Harvey Norman, Good Guys, Bing Lee Electrics for $159 AUD or can be purchase online from Amazon or directly from the Sensibo website. No static IP address required. Automatic configuration of available modes based on HVAC system capabilities. Why is this product exciting? In Australia and New Zealand (and other countries) HVAC integration has been hard because HVAC companies do not utilise the honeywell based wiring that most smart thermostats like Nest, Ecobee and Honeywell use. Split Systems have been extremely hard as traditionally they only offer IR based remote controls. In the past we have integrated these systems by learning every combination of IR code however this is extremely time consuming. 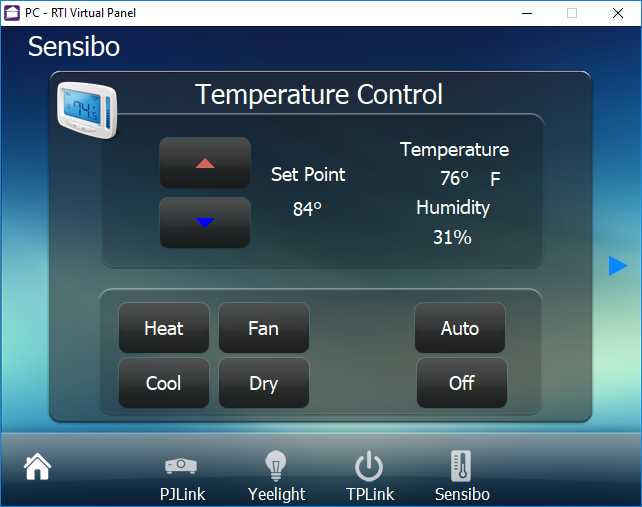 Now with the Sensibo installers can now easily integrate HVAC systems into RTI. Sensibo is extremely affordable unlike other solutions so the cost of integration is extremely low. On top of that it communicates via wifi so dealers can now revisit old customers with compatible HVAC systems to upgrade their home automation system and integrate their HVAC systems without additional wiring. This really changes the HVAC game. 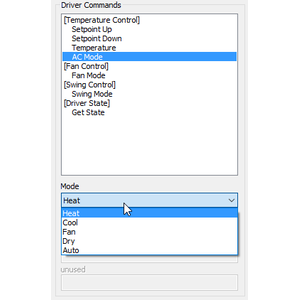 What HVAC systems can i use this driver with? Sensibo is compatible with a range of infra-red HVAC systems. Please see the Sensibo website to check if the HVAC system you want to integrate is compatible. 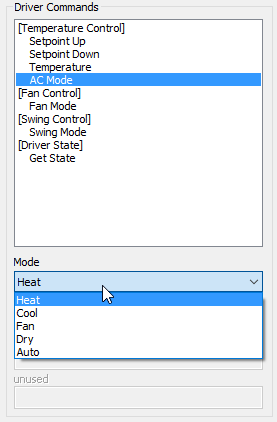 Can i control fan direction with this? Yes our driver allows for swing control. This is accessible via a driver command. Where can i purchase this module? Do you offer showroom discounts? We offer dealers a free showroom licence for demonstration and educational purposes. See link below for T&C's and signup procedure. I want to try this driver out before buying it? All Chowmain drivers for RTI come with a 7 day trial. Just add the driver and you're good to go. No registration required.